April Stafford has worked as Director of Office of Design Management since January 2013. She joined the Mint in November 2000 as Education Coordinator for H.I.P. Pocket Change, the Mint’s website for children and teachers. 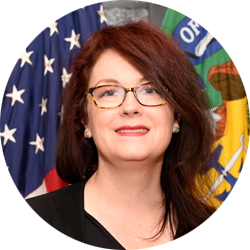 After growing this program into the larger Mint-wide Education Initiative, April served as Outreach and Education Branch Chief where her responsibility included management of the usmint.gov informational site. Following consecutive assignments acting as Assistant Director of Special Programs/Products and later Brand Management, April joined the Customer Operations group to manage the Integrated Retail Information System (IRIS) Program’s Call Center and Fulfillment services contract. After a successful transition to a new service provider, April served in Customer Operations as Customer Support Branch Chief.